Gutermann Recycled rPet Sew-All Polyester Thread is the better way to use discarded plastic rPet bottles and recycle them into something useful rather than putting them into landfills. 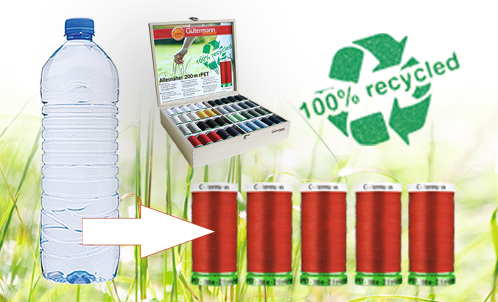 10 spools of 100% Recycled Polyester Sew-all Thread are produced from just one PET beverage bottle, with the same high quality as the existing Gutermann Sew-all Polyester Thread -- and the same price point! A beautiful way to do your part to protect the environment. 100wt.